Proverbs 31:8-9 says, “Speak up for those who cannot speak for themselves; defend the rights of the poor and needy.” Who is more poor and needy, more incapable of speaking up for themselves than these unborn children, created in the image of God? Who in our country has been stripped of legal protection and is being killed at the rate of over one million per year? And who will speak up for them if not us? Nearly thirty years ago Nanci and I opened our home to a pregnant teenage girl who had been kicked out by her non-christian parents. We helped her place the child for adoption, and had the joy of seeing her come to Christ. She had two abortions, one before and one after the child born when she was with us. Today she remains a dear friend. She is also a passionate advocate of the unborn, and goes into prisons telling women about Christ and leading Bible studies to help them find forgiveness and healing from their abortions. After what we learned from having her in our home, Nanci and I knew we had to do something about helping other girls in crisis pregnancies. I joined the board of the first crisis pregnancy center in the Pacific Northwest. It was only later that I became involved in civil disobedience on behalf of unborn children. We started with a concern for the women, and have never lost our commitment to helping women in these pregnancies—financially, medically, legally, psychologically, and in any way we can. When you have stood outside an abortion clinic every week for years, as my wife did, talking to women who have been lied to and told they’re not really carrying a child, and that an abortion will solve their problems, it changes you. When you have held in your hands the remains of an aborted child, as I have, it brands you deep in your heart. When you have seen the world of abortion on the inside, it is, I suppose, like touring a slave ship. You will vomit and weep and never forget it. It will wake you up in the night and you will find yourself crying for the innocent. Forgive me if I do not sound dispassionate about this issue. I am not. Even as I typed this, I had to wipe away the tears to see the words. How I long for our Lord to bring to us a New Earth, without war, racism, and hatred, without suffering, evil, holocausts, the exploitation of women, and the killing of children! Wondering how you can help the unborn and their moms? Go to 50 Ways To Help Unborn Babies and Their Mothers to find practical ways for everyone—not just pastors and church leaders—to get involved and make a difference. I have been preaching a lot recently on the story of the Good Samaritan. I believe it’s a fitting message because there are so many people lying at the side of the road today; there are so many who are suffering and need Jesus—both for salvation and for those practical, life-sustaining needs we all have. 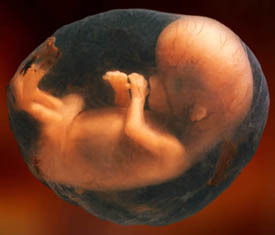 If an Unborn Baby Is Better off in God’s Presence, then Why Do Christians Consider Abortion a Crime Against the Unborn? In the first century, Christ's followers were recognized immediately. What gave them away?